Homepage. This page: A head-on view of a vintage Fiat. "Do you have any clues to offer about the make/model of this car, please?" So began Nick's email to me in March 2018, regarding a family photo he has that dates to 1937 and was taken in Grays, Essex. 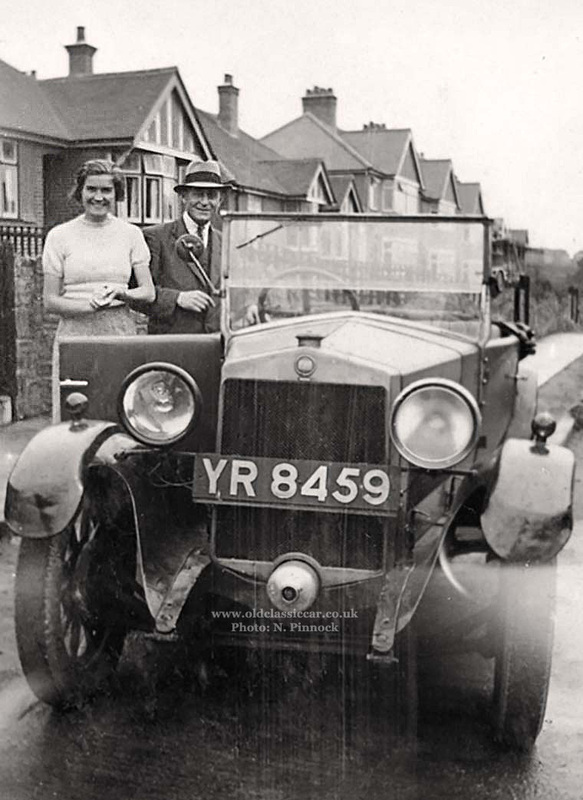 The lady in the photo is his mother, the car though had yet to be identified. The shape of the radiator and the badge upon it, were both clues, as was the laurel wreath that can be made out around the perimeter of the badge. Blowing up the image revealed the script on the badge and confirmed that the car is a Fiat, and a little more digging pointed to it being a Fiat 509, or possibly the revised 509A. 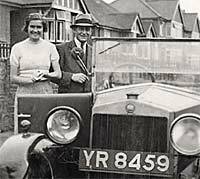 The registration - YR 8459 - is a London series, that only ran between September 1926 and January 1927, confirming that the Fiat tourer shown below is a mid/late 1926 example of the 509/509A breed. Clearly the car had seen a lot of use over the ten years or so that it had been on the road. The Fiat's wings bear witness to a number of altercations with other objects, while neither paintwork nor the plated radiator surround shine like they would once have done. I'm still undecided whether the o/s/f headlamp lens is just clear glass, or missing altogether - perhaps broken. Note the stylish sidelights fitted to both front wings. The 509 was introduced in 1925 as a replacement for the Fiat 501 (period photos of which can be found on this page). A number of upgrades were introduced in 1926 - the year of the car shown above - after which the model name was altered to 509A. The engine employed was a 990cc ohc unit with thermo-syphon cooling. Over 90,000 examples were produced between 1925 and 1929 - considering that in the late 1920s there were approximately 172,000 privately-registered cars in Italy full stop, it gives a clue as to this car's popularity in what was, after all, it's main market.